This paper presents a perspective for designing and living in complex, interactive architectural systems  that are part of ‘artifact ecologies .’ All organisms co-evolve with their environments and change their respective environments to better suit their needs – this is known as ecological niche construction . For many organisms, including humans, niche construction entails making ‘a better world to live in’  by actively cultivating and shepherding other organisms. But humans are relatively unique with respect to ecological niche construction because humans also cultivate their environment to make ‘a better world to think in’. That is, humans also cultivate and shepherd abstract information systems just as they do other organisms (e.g., flowers or crops or animals). Humans tend to their information systems and devices in the service of improving the cognitive dimensions of their ecological niche. This perspective is useful for contemplating the roles and obligations of designers and users with respect to complex, interactive, and intelligent information systems and devices, including buildings. This paper posits that the near future of innovation in environmental design and management will increasingly be driven by the cognitive niche construction aspect of ecological niche construction. This perspective is useful because it frames the integration of computational technologies into environmental systems in a way that illuminates the continuity of human behavior in utilizing physical and non-physical architectures as part of ongoing physical and cognitive ecological niche construction. All things (including organisms and ideas) have form, and having form means that there is a structure to matter and/or energy. Structure means that there is a logic to the form and logic means that there is information embedded in the form. Therefore all things (including tools, thoughts, and organisms) are information systems. Of course things don’t just exist as static forms (e.g., static information systems). Things do things. What a thing does is known as its behavior. Behavior requires energy, entails a pattern or sequence of assumed forms through time and is therefore also structured and that means that there is a logic and embedded information to behavior as well. The symbiosis of the respective logics of structure and behavior is known as the architecture of the thing. This concept of architecture (symbiosis of the respective logics of structure and behavior) may be abstracted and extended in three important ways. First, logical structure and logical behavior can exist independent of physical structure (i.e., form) and physical behavior (e.g., an equation). Given this, it is possible to have both physical architecture (i.e., physical formal and behavioral logic) and non-physical architecture (i.e., non-physical formal and behavioral logic). Second, there are natural corollaries between physical architecture and the corporeality of organisms’ bodies and the physical, non-living components of the environment (e.g., mountains and rivers), on the one hand, and non-physical architecture and the sensory and cognitive forms and behaviors of organisms, on the other hand. Third, by framing the nature of physical and non-physical architectures in this way, it is possible to put physical architecture and non-physical architecture (including both people’s physiological and abstract, cognitive being) into the same abstract representational framework and therefore show a continuity between the two forms of architecture (i.e., physical and non-physical). From this perspective, when an organism interacts with its environment or with another organism or with a computational tool, it may be said that two or more information systems are co-processing each other (e.g., exchanging information), and through the exchange of information, transforming each other. Ideally, this co-processing is symbiotic. Symbiosis is a condition wherein information systems process each other in mutually beneficial ways. Symbiosis can be complex and manifest across many organisms (e.g., information systems). From this perspective, when considering organisms, buildings, things, and computational systems all to be information systems that manifest the same basic aspects (e.g., logical physical and non-physical structures and behaviors) and that continuously process each other, it is easier to see how they are all deeply interconnected and this interconnectedness transcends the existence and/or role of humanity (or any one entity) in the information ecosystem. All things, creatures, and ideas are information systems that process each other in order to construct, refine, and extent their respective physical, biological, and non-physical (cognitive/conceptual) ecological niches. The condition is what it always has been and always will be. So when in contemporary architectural theory authors discuss the current hot topic of computational ecologies, what is really discussed is a condition that has always existed and that is not fundamentally new. Fundamentally, the components of a computational ecology are also just information systems in both physical and non-physical form that process each other to effect useful transformations of each other. With respect to this view of all physical and non-physical systems as information systems that process each other, a useful concept to consider is that of ecological niche construction. Ecological niche construction is a system of systems evolutionary process whereby any given information system (e.g., organism, physical architecture, non-physical architecture) exerts influence on its ecosystem in order to make it more favorable to its respective continued existence. There are four primary aspects to ecological niche construction: ecosystem engineering, modification of selection pressures, ecological inheritance, and adaptation. Ecosystem engineering is the processing of the logical structure or behavior of other information systems within the environment by an information system of interest in order to make the other information systems more useful and less threatening to the information system of interest. For instance, an organism may re-arrange plants and rocks and soil to make navigating in its environment safer and more efficient. Modification of selection pressures is the process of making changes to other information systems in the environment such that evolutionary natural selection pressures are relieved. For instance, an organism may thrive by cultivating plants or animals such that it has a consistent food supply that is not subject to changing environmental conditions and thereby reduces the risk of starvation. Ecological inheritance is the process of one generation of information systems (e.g., organisms) conducting ecosystem engineering and/or modification of selection pressures and/or adaptation in such a way that future generations of that generation’s information systems (e.g., organisms) continue to benefit from the ecological modifications made by previous generations. For instance, if an organism builds a nest and then its progeny are able to maintain the nest and add onto it such that it grows over time and affords more protection and storage over time, this is an example of ecological inheritance because the ecosystem engineering endures across generations. Adaptation is an internal response to environmental pressures. For instance, an organism that cannot thrive because of too many poisonous predators can change its own selection pressures by developing an immunity to the poisons such that the poisonous organisms in its ecosystem no longer constitute threats . 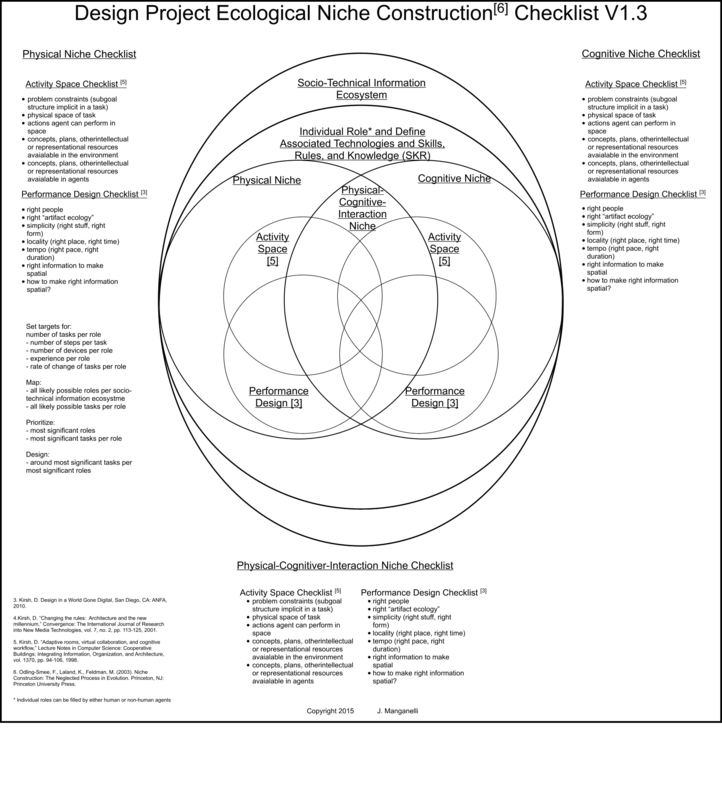 Bringing this back to the discussion of humans and their physical and non-physical architectures (both those that are external to them and those of which they are composed), the various information systems described above (be they organism, object, or idea) do not exist in separate ecologies but in a shared ecology. However, each information system exerts influence on the ecology and attempts to make it a ‘better ecology in which to live’. Humans, moreso than any other species, are information systems that exert influence on their ecological niche in order to make ‘a better ecology in which to think’ . The contemporary proliferation of discussion on computational technologies and computational ecologies manifests all four tenets of ecological niche construction both with respect to our physical and cognitive ecological niches (the ecological niche construction construct of adaptation may also be understood to be manifest if one assumes an extended mind/embodied cognition theoretical framework as the theory of mind ). In summary, given that computational technologies (and ecologies) are the same in kind (i.e., information systems with physical and non-physical aspects that process each other) as all other physical and non-physical architectures (including humans), incorporating them into the design of the architectural environment is a logical and non-controversial activity and less ‘new’ than it is at times portrayed. Rather, there are two more critical issues worthy of focus: the concept of cognitive niche construction (or the cognitive aspect of ecological niche construction); and the usefulness and ethics of how and when new computational technologies are introduced into the human ecological niche. These points will be elaborated, but first it is useful to describe the differences between how physical and non-physical architectures are usable by information systems such as humans. The content of multi-media technologies are not expressly bound by the laws of physics and as such offer ways to conceive of time, space, and interactions that cannot be modeled in reality but which may be useful for structuring thought nonetheless. The granularity of stimuli can be tuned to a very large degree and changed moment to moment, thereby tailoring data to only what is needed to evoke a particular response. While there are time constraints on the production of content, in general, there are no limitations placed on content creation due to scarcity of material. As a result, the palette is almost infinite. The content is independent of the multi-media display to the extent that almost any message can be portrayed through any device – the limitations of the nature of the physical device do not restrict the sort of meaning it can convey. The built environment is inhabitable in the physical world and bears a direct and involuntary relationship with the laws of the physical world, thereby bound to offer a sense of connectedness not necessarily present in multi-media technology. The built environment is enduring – relative to the endurance of any form of multi-media, and there is a persistence of type and level of stimulation offered by the built environment that allows for an aggregation of similar but non-identical interactions within a range of changing temporal and environmental conditions leading to a depth of experience – a situatedness – not yet possible with multi-media. Experience of the built environment is continuous and involuntary 24 hours a day, cradle to grave – we have always been completely immersed in the built environment and cannot alter this state. The meaning and degree of stimulation afforded by the built environment often exists in the background and we are only aware of it if and when we choose to focus on it. Thus the built environment offers subtle yet persistent cues that keep certain ideas and/or states primed without requiring our focused attention. This differs markedly from most multi-media technologies which typically (though not always) require focused attention for their information to be perceived. Most importantly, the built environment engages fully all of the senses at a level of depth and complexity which multi-media has not yet begun to approach. What is the merit of a comparative analysis of these two powerful forms of cognitive/emotional priming? How can these two technologies be brought to work in symbiosis in support of human endeavor? These questions can be reframed to place the physical and the computational into one logical/cognitive framework. This essay offers one theoretical means for doing so by drawing on concepts from the literature of systems science, complexity science, human factors, ecological niche construction, and cognitive science. This assertion is profound because it suggests that mind transcends body and understands aspects of the environment and the artifacts it makes as integral to itself. This phenomenon is known as embodied cognition . That cognition is primed both by physical and non-physical artifacts and experiences suggests that the underlying logical architecture of all artifacts, whether physical or non-physical, is what humans actually cultivate in order to, “build a better world to think in”. Once the physical is abstracted to be seen as just a different manifestation of a logical architecture, it is possible to place our physical artifacts and experiences in the same framework as computational artifacts and experiences and to see the design and use of each as differing only in the details of their articulation and use but fundamentally similar in kind. That is, the physical and non-physical architectures of our world are both just cultivated information systems used by people (and other cognizing agents) to think and act. David Kirsh is a cognitive scientist whose writings offer some ideas on how to operationalize the ways in which our environments and technologies are cultivated and shepherded to help us to think. He notes that designers typically design for three purposes: efficiency, experience, and effectiveness . Efficiency design, Kirsh argues, entails placing the right people in the right “artifact ecology” so that they optimize how tasks are performed and achieve their goals . Kirsh equates efficiency design with the practice of evidence-based design, noting that it is useful for certain design challenges but that there are many design challenges that are not strictly about task performance optimization. For instance, Kirsh notes that rich quality of experience can also be a design goal, whether or not a quality experience is efficient or even useful. Finally, Kirsh defines “effectiveness design” as embodying the following: “1) simplicity (right stuff, right form); 2) locality (right place, right time); 3) tempo (right pace, right duration).” Kirsh notes that a key question for effectiveness design is, “what is the right information to make spatial and how?” Spatial information, if used effectively, can simplify choice, perception, and reduce cognitive load . “Architecture is about to enter its first magical phase: a time when buildings actively cooperate with their inhabitants; when objects know what they are, where they are, what is near them; when social and physical space lose their tight coupling; when walls and partitions change with mood and task. As engineers and scientists explore how to digitize the world around us, the classical constraints of design, ruled so long by the physics of space, time, and material, are starting to crumble. 2. We need to tune rooms to the social needs of users as they interact. Kirsh predicts that designers will design such environments by categorizing design activities into the design of passive objects, reactive objects, active objects, and information objects . Kirsh’s constructs and strategies can be understood through and integrated with the construct of ecological niche construction to arrive at the constructs of physical niche construction, cognitive niche construction, and physical-cognitive-interaction niche construction as key aspects of environmental design and use. Kirsh’s strategies and constructs may be interpreted with respect to each of the four tenets of ecological niche construction. First, Kirsh’s constructs ‘passive objects, reactive objects, and active objects’ may be subsumed into his construct of ‘information objects’ is . That is, all things are information systems, or in Kirsh’s language, ‘information objects’. Second, whereas Kirsh’s writings are human-centric, application of his ideas must be expanded to encompass all cognizing agents that use and participate in our computationally augmented environments, including software agents, robots, and other forms of perception and intelligence that act within the environment. Third, Kirsh’s ‘performance design’ and ‘activity space’ constructs can be interpreted in light of the ecological niche construction constructs of ecosystem engineering, modification of selection pressures, ecological inheritance, and adaptation. Doing so increases the power and usefulness of these constructs, especially if the aspects of ecological niche construction are split out into the following: the physical aspect, the cognitive aspect, the phsyical-cognitive-interaction aspect. In this way, designers can frame, plan, and execute their design work in order to design for both physical accommodation of occupants but also the cognitive performance and well-being of occupants (see Design Project Ecological Niche Construction Checklist image below). Bringing this back around to the design of building architecture as part of an information systems artifact ecology, it is helpful to think of the designers’ and occupants’ roles as that of gardeners, farmers, and shepherds, (and sometimes colleagues or subordinates) and of the information systems as crops and a sort of livestock (and sometimes colleagues or superiors). This view is useful (even if it seems a priori to be simplistic) because it facilitates using literature on the ethics of agriculture and animal husbandry as initial guidelines for how humans should interact with complex, interactive architectural ecosystems, including computational technologies, that co-inhabit our ecological niche. This is important because like plants and livestock, these computational technologies may be seen to have varying degrees of personhood depending upon their perceptual and cognitive abilities. How we represent, interact with, and utilize these agents as part of our ecological niche can therefore (initially) be guided by our understanding of how to ethically interact with the plants and animals that co-inhabit our ecological niche. This perspective yields four preliminary useful observations. First, it suggests the extent to which our existence, comfort, and productivity are dependent upon having and maintaining these information systems and interactive systems in symbiotic relationships. Quite simply, the evolving human ecological niche is now dependent on the use of complex, interactive (architectural) information ecosystems and devices to maintain symbiosis. A change away from this condition is possible but our civilization is so far down the path of integrating these technologies into our ecological niche that a quick change away from this endeavor would be disruptive and damaging to cognition, action, and society. Second, this perspective suggests the elevated status of information systems and interactive technologies as having varying degrees of person-hood and social standing (as do other organisms that we cultivate and shepherd) in our environments and the concomitant obligation that we have toward them for their well-being and proliferation. Since there is a social dimension to our interaction with and use of our physical and non-physical architectures, maintenance and interaction must be a consistent and equitable practice in order to optimize symbiosis. Third, while some information systems may equal or surpass humans with respect to perceptual and cognitive abilities, most information systems for the foreseeable future will exist as subordinates to humans, just as existing livestock and crops occupy subordinate roles in symbiosis with humanity. Fourth, it is likely that advanced, perceiving and cognizing information systems will one day also be categorized according to a taxonomy and identified according to kingdom, phylum, class, order, family, genus, and species. Given this, it is possible to reconsider our own taxonomy as a taxonomy of biological information systems that will be extended to account for non-biological perceiving and cognizing information systems as well. The benefit of extending our taxonomy in this way is that we will have placed all of our biological, physical, and non-physical perceiving and cognizing information systems into one taxonomic classification system. If one indulges this perspective, there are a number of tenets and observations that shake out from it. First, with respect to observations 2 and 3 above, different information systems have different levels of awareness and intelligence. One way in which naturally occurring information systems are bounded is through their corporeality. It may be that it is to the benefit of human information systems to bound computational information systems through corporeal instantiation (i.e., give powerful artificial intelligence systems bodies in the physical world and also physical needs). There are two primary motivations for doing so. First, at a basic level, instantiating computational information systems in physical form will make it easier to develop shared experiences with them and therefore to cultivate relationships and mutual sympathy/empathy. Second, as the intelligence of computational systems equals or surpasses human intelligence, the potential threat that they represent to humans (as competitors and/or masters) can be mitigated by bounding the power of their logic and action such that their logic and action has to pass through physical logic gates. This will ensure that an artificial intelligence, for instance, cannot not grow so all-knowing, all-perceiving, and able to act that it becomes an insurmountable threat to humanity or any other living system. Second, the duration of relevance of information systems must be tuned so that it is in symbiosis with the duration of relevance of human information systems. That is, it may be that the pace of evolution of computational assets is restricted (governed) and entrained to the pace of evolution of human social, cultural, and cognitive assimilation of information (and technologies) within the ecological niche. This regulation of computational asset evolution will slow innovation in many cases and require fundamental changes to how economies function. Third, computational assets will come to increasingly shape the information systems ecosystem to their own advantage and human information systems must be partners with computation assets and not adversaries. Human development of computational assets and their integration with other, more traditional information systems are a natural continuation of the process of ecological niche construction that plays out across all species through time. Furthermore, all physical and non-physical architectures (including organisms) are information systems processing each other to create better worlds in which to live. Humans are somewhat unique in that they modify their ecological niche (itself an information system) to produce ‘a better world in which to think’ . Integration of computation assets is a continuation of this trend, especially when considered from an embodied mind perspective [7, 10]. It is useful to think of human processing of other physical and non-physical architectures (i.e., information systems) as tending to, cultivating, and shepherding domesticated information systems (and in some cases creating equal partners or even our superiors) so that they enhance our lives and live in symbiosis with us. But it is also important to understand that as the perception and cognition of computational assets evolves to match and exceed human perceptual and cognitive abilities, they too will exert influence on our ecological niche such that they shape it to make a ‘better world to think in’ for themselves as well. This may or may not be in the best interest of humans. In this case, our investment now in symbiosis is not just equitable and benevolent in the short-term but is our greatest hedge against relegation to a subservient role to computational assets with superior perceptual and cognitive abilities that will reshape the ecological niche for their own purposes in the future. This symbiosis can be furthered by instantiating such powerful computational assets in physical form. An initial strategy for designing environments to account for the range of information systems that co-inhabit them and operationalize them (to enhance both cognition and action) may be usefully approached by marrying and extending constructs from the literature on ecological niche construction  and David Kirsh’s writings on performance design  and the development of activity spaces . Batman Begins. Dir. Christopher Nolan. Perf. Christian Bale, Michael Caine, Katie Holmes, Cillian Murphy, Liam Neeson, Morgan Freeman, Tom Wilkinson, Gary Oldman. 2005. DVD. Warner Home Video, 2007. Clark, A. Natural-Born Cyborgs: Minds, Technologies, and the Future of Human Intelligence. New York, New York: Oxford University Press. 2003. Kirsh, D. “Changing the rules: Architecture and the new millennium,” Convergence: The International Journal of Research into New Media Technologies, vol. 7, no. 2, pp. 113-125, 2001. Kirsh, D. “Adaptive rooms, virtual collaboration, and cognitive workflow,” Lecture Notes in Computer Science: Cooperative Buildings: Integrating Information, Organization, and Architecture, vol. 1370, pp. 94-106, 1998. Odling-Smee, F., Laland, K., Feldman, M. (2003). Niche Construction: The Neglected Process in Evolution. Princeton, NJ: Princeton University Press. Wilson, M. “Six views of embodied cognition,” Psychonomic Bulletin, vol. 9, no. 4, pp. 625-636, 2002. Manganelli, J. “Architecture as a Cognitive Priming Agent: Thoughts While Watching Batman Begins,” retrieved on 150511from: https://datastructureformdesign.com/2013/01/06/architecture-as-a-cognitive-priming-agent-thoughts-while-watching-batman-begins/; 2005. Manganelli, J. Designing Complex, Interactive, Architectural Systems with CIAS-DM: A Model-Based, Human-Centered, Design & Analysis Methodology. retrieved on 150511 from: http://tigerprints.clemson.edu/cgi/viewcontent.cgi?article=2250&context=all_dissertations; 2013. Byrne, D., Eno, B., Frantz, C., Harrison, J., Weymouth, T. (1980). Once in a lifetime [Recorded by Talking Heads]. On Remain in the Light [LP]. Bahamas; New York City, New York; Los Angeles, CA: Sire Records.